It has been a busy time for 17 P7M Gp here in Cyprus since my first blog here is some of what we have been up to. Since my first blog we have been extremely busy here in Nicosia. The Force Commander for the military component of UNFICYP is Major General Chao Liu of the People Republic of China, so yes we are in the unusual position of being commanded by a Chinese General. His Chief of Staff, however is Colonel Angus Loudon MBE late R Irish. Later this month Maj Gen Liu will be visiting us at the Ledra Palace Hotel to carry out the Force Commander’s Inspection and prior to that Col Loudon first visited to carry out his own inspection. This meant that WO2 (SSM) Pitt of the Ops Squadron was able to demonstrate his new fully trained Honour Guard team to Col Loudon for his first official visit to 17 P&M Gp. Col Loudon then became the first visitor to sign the brand new Officer’s Mess Visitors book, before spending the day visiting various departments and also going on patrol into the Buffer Zone. 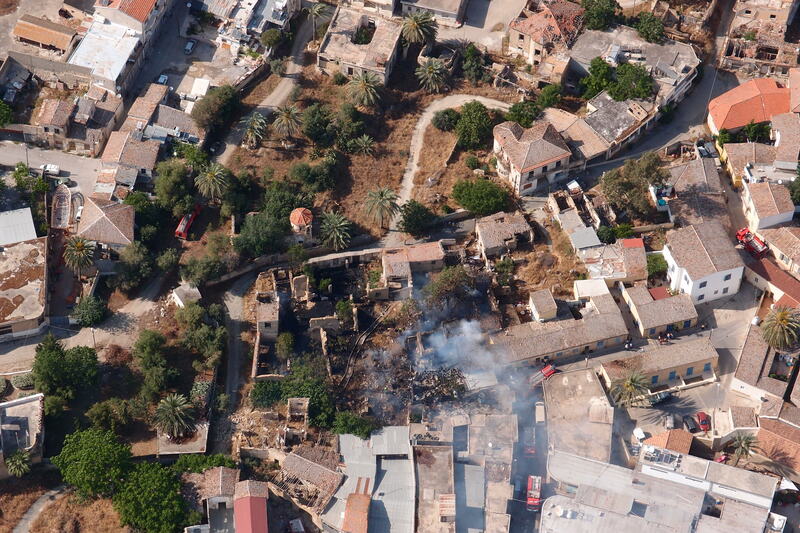 A fire breaks out in the Buffer Zone. Photo by Maj Adrian Spicer. The heat is on for 17 P&M Gp already, as the island is experiencing an early period of hot weather with temperatures unseasonably high, the result has been an early outbreak of fires on the Buffer Zone and indeed a fire also broke out in one of the abandoned buildings in the Old City part of the Buffer Zone in Nicosia. 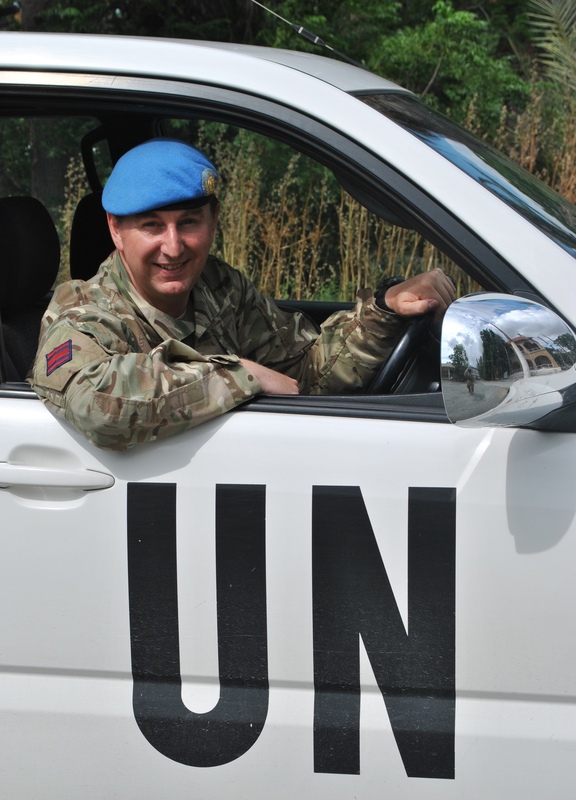 This was quite a serious incident and saw 17 P&M’s Deputy Commander Major Adrian Spicer literally rise to the occasion, when he took to the sky in an Argentine UN Helicopter to assess the situation. 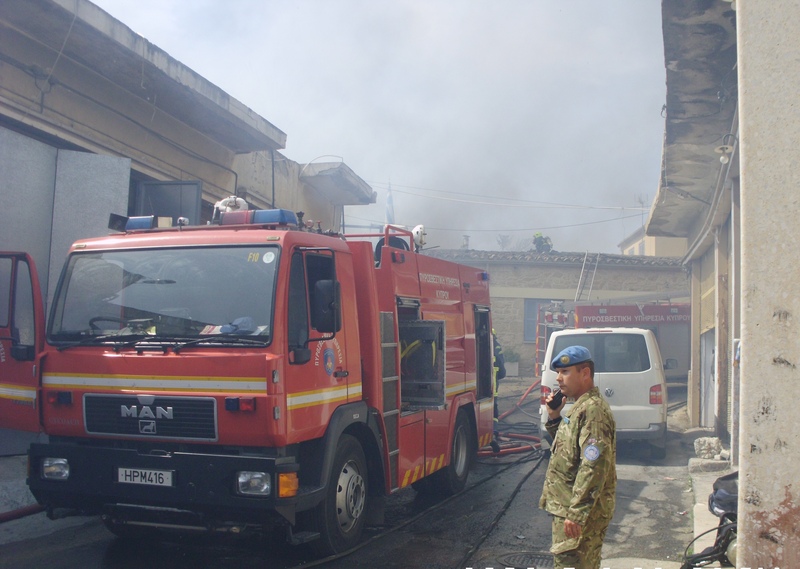 Meanwhile on the ground Major Chris Hike one of our Military Observation and Liaison Officers was able to help coordinate the efforts of both the Greek and Turkish Cypriot Fire-fighters who tackled the blaze from their respective sides of the fire. Maj Hike RLC(V) coordinates Turkish and Greek Firefighters during the Buffer Zone Fire. The situation was brought under control but not before one of the buildings collapsed and extensive damage was caused. This incident has therefore reinforced to us all here the very the real risk of fire that we were already prepared for. The last few days have also been ones of remembrance. 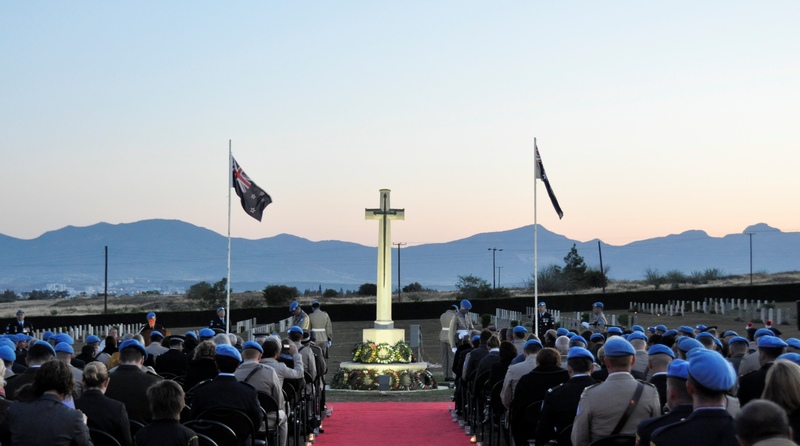 UNFICYP has a UN POLICE element to it, which has a strong Australian contingent, and every year at dawn on April 25, Australians and New Zealanders gather to remember the fallen and in particular those who died at ANZAC Cove on the Gallipoli Peninsular. Wherever they are in the world Aussies and Kiwis pause to remember, as this day in 1915 during the First World War, the soldiers from these two Dominions of the Old British Empire landed on the Turkish mainland. This was the day when the soldiers of Australia and New Zealand by their deeds began to forge a national identity for the countries we now know. Here in Cyprus in the Commonwealth War Graves Cemetery, the Australian Police Contingent, invited the CO, Lt Col Rob Askew RLC and officers and men from 17 P&M Gp to join them for their dawn service. We assembled in the cemetery and at 5am, as dawn was breaking, under the watchful eyes of Turkish soldiers in two observation posts and with the twinkling lights of Nicosia in the background, our Fijian Choir sang a lament to open the ceremony. The ceremony was conducted by an Australian Master of Ceremonies from the Australian Federal Police, with the assistance of our Padre, The Reverend Mark Ewbank CF, who conducted the religious element of the ceremony. 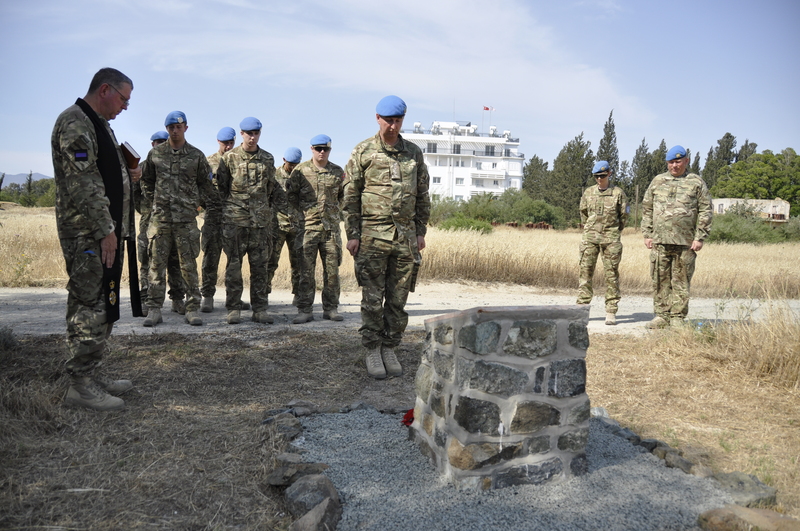 Wreaths were then laid by Australian, New Zealand and British High Commissions, the French Ambassador, The UN Chief Of Mission, The UNFICYP Force Commander and various others. A more personal remembrance ceremony has also been held on May 3 by the Royal Engineers serving with 17 Port and Maritime Group. We gathered to remember one of our own, WO2 (QMSI ) Graham Bean RE(V), who sadly died two years ago on this date while serving with the 3 Royal Anglian Group here on Op TOSCA. The short ceremony was again conducted by our Padre and finished with a wreath being laid at Graham’s memorial stone in the Buffer Zone. This entry was posted in 17 Port and Maritime, MOGV, TA and tagged 17 Port and Maritime, British, British Army, Cyprus, Media operations group, Nicosia, Peacekeeping, reserve, territorial army, UNFICYP, United Nations. Bookmark the permalink.